Toshiko Miura, a tour guide, spoke those words through a translator as she stood next to a monument erected in their memory. Her pain, however, needed no translation. It was obvious from the tears in her eyes. 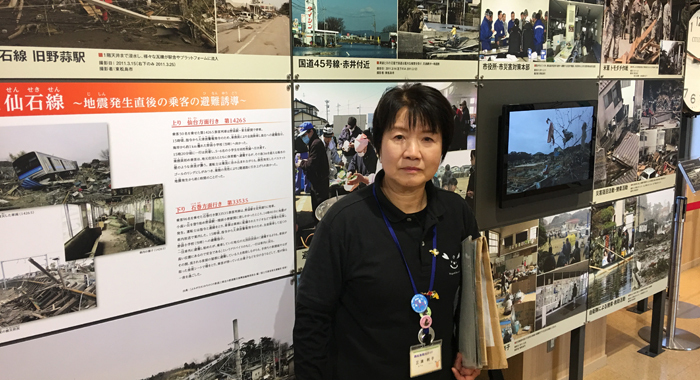 Miura, 64, was leading a group of visiting reporters in the 2018 Pacific-Caribbean Journalists Program on a tour of her hometown, Nobiru, Higashimatsushima City, one of the areas devastated by the Great East Japan Earthquake and tsunami. 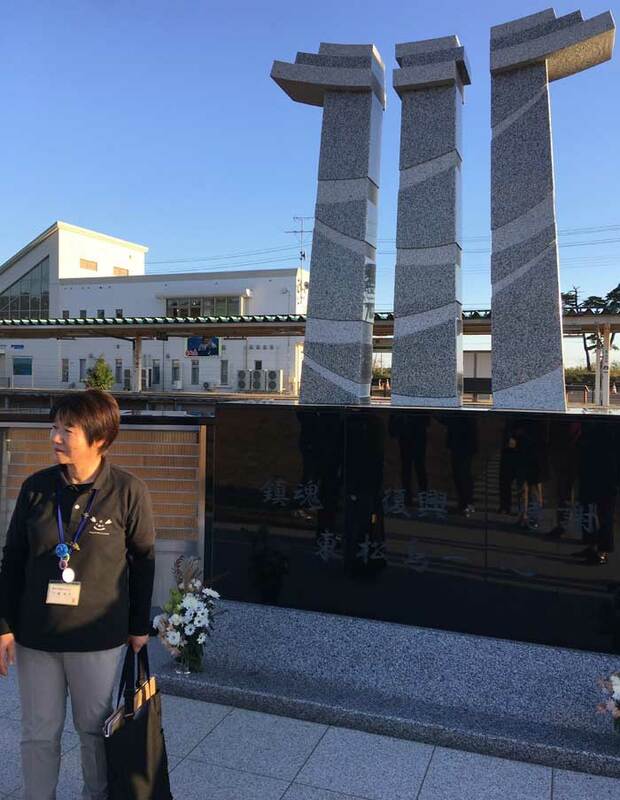 She had been a tour guide long before the March 11, 2011 disaster that resulted in 1,113 deaths in the area, and more than 19,000 throughout Japan. Those who were not killed by the shaking or the waves died of exposure on that bitterly cold day. One year later, Miura’s responsibility as a tour guide would include taking people on guided tours of her devastated community. “I myself I was here at the time of the disaster,” she says, adding that she had participated in drills in the past, and had run to the evacuation site and was saved. Among those killed was her 84-year-old father. “He was at the daycare centre for adults,” she says. In addition to the lives lost, some 3,000 residents left the city after the disaster, preferring to live far away from any reminders, and the potential for a similar event in the future. Nobiru’s population now hovers around 40,000. 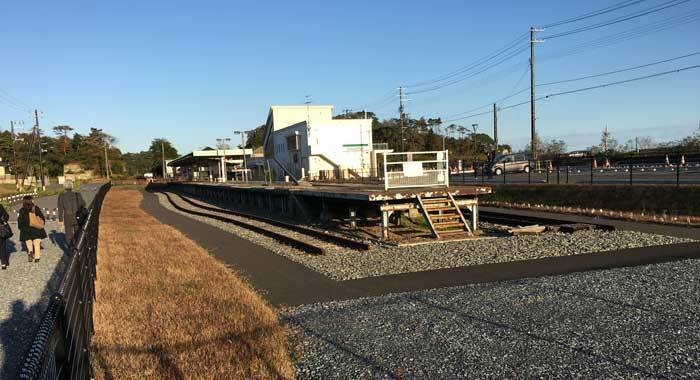 The JR Nobiru Train Station, from which two trains had departed about one minute before the magnitude 9 quake struck at 2:46 p.m., has been rebuilt on higher land. So, too, have many homes and the local primary school. Roads have been reconstructed, along with a museum and education centre in a building where the water had risen 12 feet, forcing the people seeking shelter there to use furniture to make a stairway to the roof. Among the exhibits inside is a train ticket vending machine destroyed by the quake. There’s also a clock that once hung on the wall of the gymnasium of the local primary school. It forever reads “2:48”. What could not be repaired quickly is the psychological trauma that the disaster inflicted on Nobiru’s residents. In three prefectures, 1,700 students lost one or both parents. Eighty-four of those students are from Nobiru. The academic performance of students in the area fell 10 per cent below the national average. In response, their summer vacation was shortened by four days. In addition to professional counselling, they received help from parents, university students, and other volunteers. Despite the constant reminder of the tragedy that comes with her work, Miura thinks it’s the right thing to do. 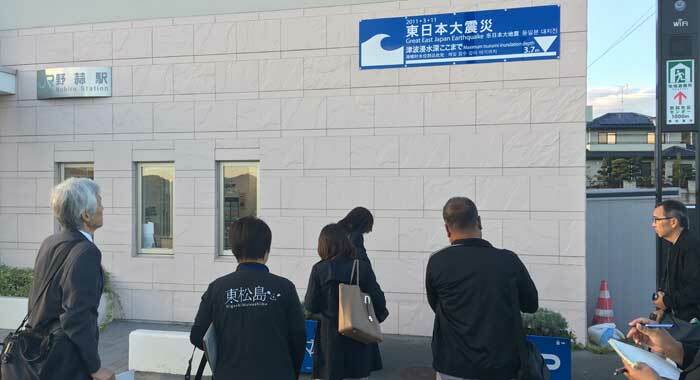 “Right after the disaster, we received a lot of support from inside and outside of Japan,” she said, adding that she attaches a lot of importance to educating people about tsunami and their impact, and, thereby contributing to reducing the potential loss of life. “That is the thinking why I keep doing this job,” she said. I hope Japan has declared the 11th of March, a national holiday to commemorate the lives of those who were lost on that fateful day. They are very resilient people nevertheless and to look at Japan now in comparison to what it looked like on that dreaded day is really unbelievably astounding. No sign of the magnitude of devastation can not be seen or easily noticed today unless something was pointed out to u and you’re told about it. Japanese are the ants in the human world.